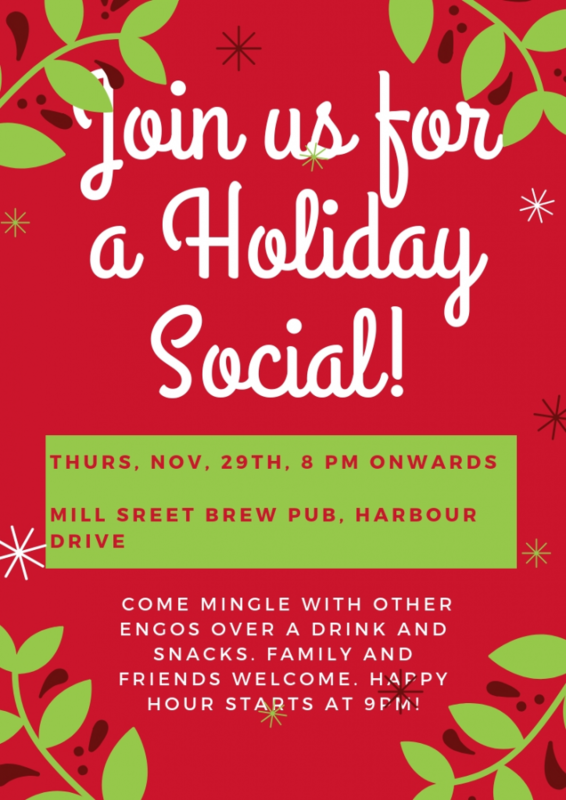 Nature NL members, supporters, and friends are invited to a holiday social on Thursday, November 29th, downtown at Mill Street Brew Pub, 135 Harbour Drive in St. John’s. Come have a coffee or a beer with people from a huge variety of environmental organizations in and around the northeast Avalon. Meet up with old friends and make some new ones. We encourage you to walk, take the Metrobus, or carpool with a friend (both for environmental reasons, and if you’ll be having any alcohol!). However, if you do need to drive, at the moment there are no scheduled events at Mile One, which means there should be free parking available on the street and in the Atlantic Place garage (accessed from Harbour Drive). A special note for members who have been with us for a while: You may remember our annual parties at The Environmental Gathering Place, which were a long-standing tradition up until last year! We aren’t able to rent space at that location anymore, so the traditional joint holiday potluck party has required a bit of a rethink this year. We hope you enjoy the joint gathering at Mill Street – please let us know if you have any thoughts on this new format!